Tentatively, I'll be on two panels: Eatin' Mummies and Other Strange Victorian Fads, and Writing for Young Adults. In a beautiful crystal pavilion in a richly enchanted land, there will be a special place for literary events as Fantasy Faire celebrates the power of words with its second Literary Festival. 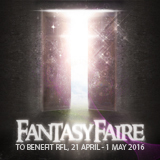 Here we shall stage readings, workshops, story-telling sessions and discussion groups, all around the theme of Fantasy.